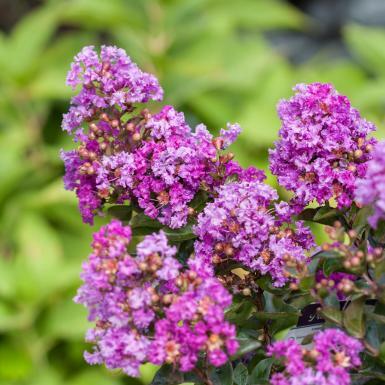 Purple Magic™ Crapemyrtle blooms in early Summer with dark purple flowers. The new growth on this dense shrub starts with a reddish tint and matures to a glossy green color that beautifully compliments the dark purple blooms. This crapemyrtle is the perfect fit for landscapes where taller crapemyrtles will not fit. As with all crapemyrtles in the Magic series, Purple Magic™ has high resistance to leaf spot and powdery mildew. In addition, this crapemyrtle will re-bloom in late Summer if the first flush of flowers are deadheaded.